I haven’t updated this blog in over a year, and I apologize for that. The reason that I made this blog was so that, in addition to having a place to talk about World of Warcraft and my characters, I would have a project that I would keep relatively regularly updating, as a practice in self-discipline. I seem to have…strayed from that original goal. There are a couple of reasons as to why I haven’t updated in 12 months. First, as a university student, my classes and extra-curriculars during the school year take up 300% of my time, and I don’t even get time to play, much less time to write about playing. Second, as I just said, I haven’t been online a whole lot, for two reasons: I just don’t have time most days, and that leveling my alts has drained my desire to play, particularly in Warlords content. Third, I have also started playing Wildstar when it went F2P, which I will attempt to make the occasional post about on this blog. I haven’t gotten very far in the game, but I am thoroughly enjoying it thus far. I’m planning on making two more posts between today and tomorrow, which will be actual blog posts. Just keep in mind: if I don’t update for a long time, and there will be times where I don’t, it just means that my daily life is really hectic and I have no time to play and/or update. Thank you so much to everyone who’ve read or followed this blog, and I promise to try my best to do more on here in the coming months. 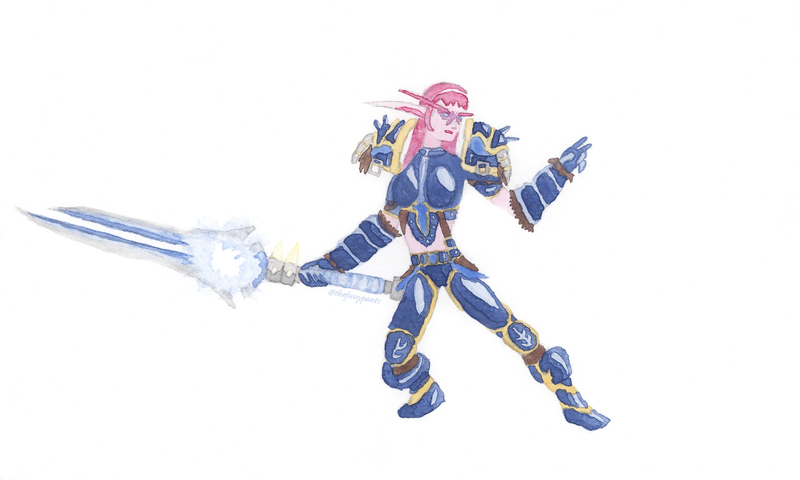 For the unaware, Growing up in Azeroth held a contest about 2 weeks ago, with 2 of the prizes being beta keys, and the other 2 being water colour paintings of a character of your choice. So…. I got 4th place, getting me a portrait of Deathdaisy. So thank you so much, Fussypants, for this incredibly fun contest, and this amazing prize! JSYK, I’m always up for art trades in the future ;)! A few days ago, the Godmother posted a series of 10 question for WoW’s 10th anniversary. I did my best to answer them, though I may have forgotten some details along the journey. I started WoW when I was quite young. My dad played the original Warcraft, Starcraft and Diablo games, and also gamed with his friends in EverQuest. Once WoW came out, they all started to switch over and continue their adventures in Azeroth. My dad caved, and we got the game in January of 2005. My dad has since lost his love for the game, claiming it’s “too easy” (as so many naysayers do), but I still adore it. The first character I ever played was Goldenblade, a female human warrior. My dad told me and my sister that we couldn’t play the same race or class, so we would experience different things – we also watched each other play, so we got the story for both anyways. If she hadn’t picked first, I would have been a Night Elf druid, believe me. Goldenblade was my main through Vanilla and BC, but was deleted coming up to Lich King. 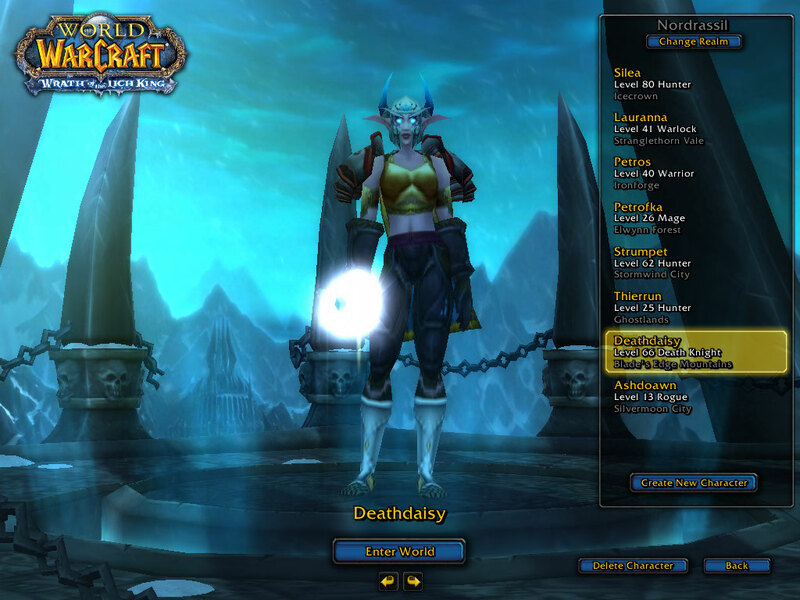 My main is now Deathdaisy, an Unholy Night Elf Death Knight. Surprisingly, I only really started playing druids in Cata, even though they are easily my favourite class. the Savior of Stoneplow questline/cinematic. These were things that made the game amazing for me: the challenges, the stories, the settings, the personal ambitions and experiences. I am, first and foremost, a casual player. It breaks my heart when people say we “ruin the game”. So we play a little differently than you, so we find our joy and excitement somewhere else – so what? I will always adore the lore of the game, exploration, pets (both collecting and battles), mount collecting, rep farming, and dungeon running when you’re 30 levels higher than the bosses. To put it simply: I am casual, and I love it! It depends on the character: my druids are usually hanging around Moonglade (one of the many reasons I love druids), my NE priest is usually in the Temple of the Moon, my Troll druid has recently fallen in love with the Filthy Animal in Dalaran, and my DK has spent more time in Molten Core than is healthy for anyone, living or otherwise. However, the one place I know I will always return to is Zangarmarsh. I cannot get over the beauty of the zone, and I absolutely love both the Cenarion Expedition and Sporregar. Absolutely! When I first started playing, I was really young, so I didn’t care, and when I went through WotLK for the first time with Deathdaisy, I was just trying so hard to get to max before Cata hit so I could do Operation: Gnomeregan. While I’ve been leveling my druids, I’ve been taking things slower, reading quest text and flavour text, and having more fun with the questing process. There are also some great references, jokes, and tearjerkers in the text. Oh, god – there will always be this one that stands out. Before Lich King came out, I had a level 16 mage who was buying pets off the auction house (using alts’ money, of course) and holding on to them for my Death Knight. Early on in the game, the Hyacinth Macaw could be bought from the same vendor as the other three. However, between launch and Lich King, it was removed and made a zone drop in STV. I bought all four parrots off the auction house, but couldn’t remember which was which. Stupid me didn’t look it up online, no of course not – I went and learned one of them. The Hyacinth Macaw. The only pet in game that is epic quality – and for good reason. It is a really freakin’ low drop, and I had to go farm it once WotLK hit. As soon as I saw those blue feathers I felt like smacking myself. So, a word to the wise: always look something up online before doing something dumb, OK? Well, I have alienated people because of my love of Blizzard games, that’s for sure (well, person). However, World of Warcraft has also gotten me to be more serious about my artwork, my character designs (planning, that is), and my writing. My story on here, Rise, Legendary? First time I’ve ever published anything that I’ve written. It’s also the first fanfiction that I’ve written, and the first original piece that I’ve written since 6th grade (I have written stuff since then, but all of it was rewritten and reworked stuff from earlier). WoW has also introduced me to many new novels and comics that I completely adore – I’ve read Lord of the Clans maybe 5 times now? I adore Christie Golden’s writing, and I am with the rest of the playerbase with hating Knaak’s. Well, there’s ten years of WoW from me! I hope you’ve all enjoyed the trip as much as I have, and I hope all of you continue to love this amazing game. I started reading WoW blogs about a month ago, but really got into the idea of making one myself after stumbling across Kamalia et Alia. 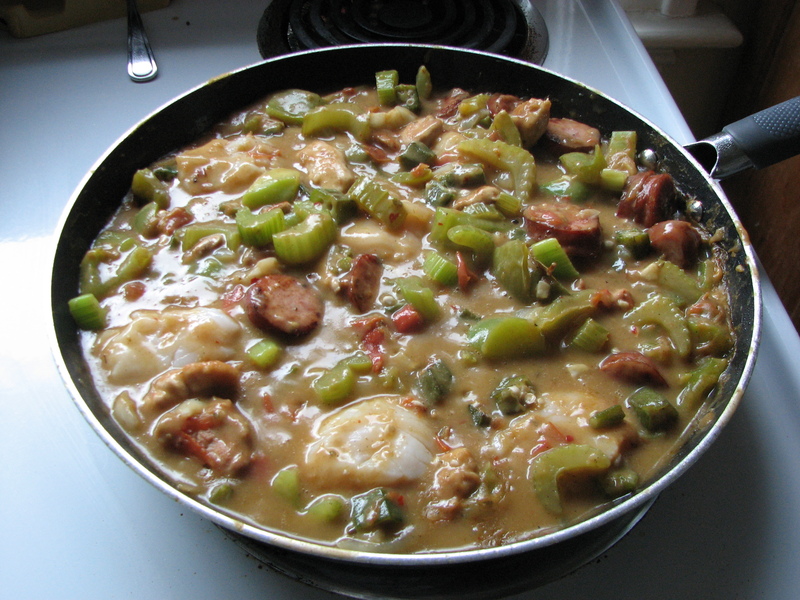 I spent most of the last couple of days perusing her blog, and came across an interesting recipe: Westfall Stew. I read through it and thought, hey, this is something I can do! So, my first real foray into the world of Azerothian cooking IRL. 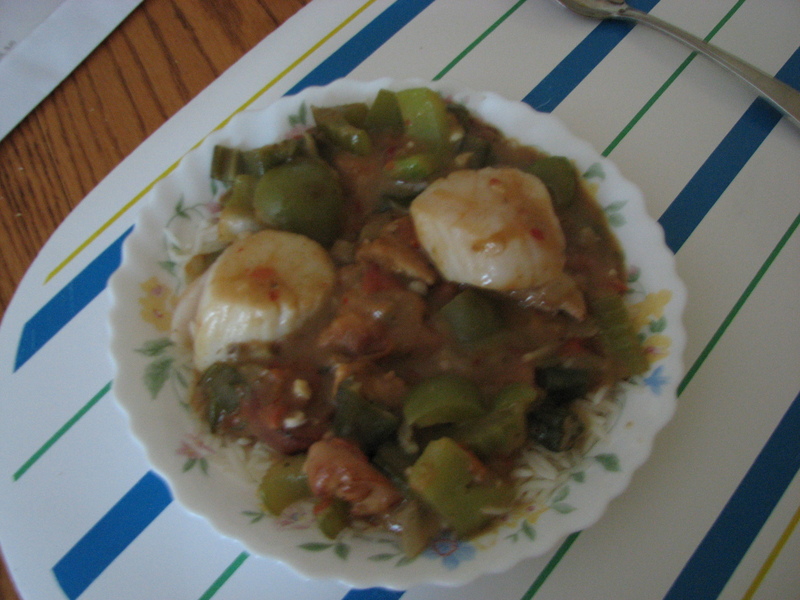 I made it for supper for me and my family tonight, and the end result was lovely. It also tasted amazing. I urge everyone reading to check out Kamalia’s blog, and also, to try any Azerothian dishes they want in the real world!